A reader wrote to ask how he can hack into the email account of the woman he's thinking about marrying, ostensibly to see if she's gold or a gold-digger. One way to satisfy this curiosity is called a keylogger. But that opens up a bunch of ethical and legal issues. Should you install a keylogger to spy on someone else? A keylogger is a small program that, when installed on the target computer, records every keystroke that is made and the context in which it is made. The resulting log file may contain a user's email password, online banking credentials, as well as the text of emails, instant messages and Facebook postings. Anything that passes through the keyboard can be captured by a keylogger. So it should be obvious that there are some thorny issues here involving privacy, ethics and the law. As for the relationship issue, if you don't trust someone now, you won't trust him or her in the future. You'll keep "checking up on them" again and again, and eventually you'll get caught. That could mean the end of a relationship or marriage, and possibly a few years in jail for you. Leon Walker of Michigan suspected that his wife was seeing another man. He logged into her Gmail account to look for evidence. Walker didn't need a keylogger in this instance. She made it easy for him by keeping her password written in a notebook right next to the family computer. But when the wife learned what Walker had done, she complained to the cops. Walker now faces up to five years in prison for felony misuse of a computer. Federal law prohibits gaining unauthorized access to another party's data stored on a computer system. It doesn't matter what your relationship is; who owns the computer; or how carelessly the other party stored her password. The password was obviously created to protect the user's privacy, and by accessing the data without permission (with a keylogger or other means) you violate that privacy right. The law recognizes a few exceptions to this rule. Prison inmates' communications are subject to unilateral search. Parents can access their children's data without permission. Employers can monitor employees' use of company computers. But you cannot invade a spouse's privacy, let alone your fiancée's. A number of parental control and employee monitoring software packages include keylogger utilities. They range in price from about $25 to $100. Generally you need unsupervised access to the target computer in order to install the keylogger software. Some keyloggers have a sneaky feature that will email the logging software to an unsuspecting user, in the hopes that they will be naïve enough to open the attachment and run a program that installs the keylogger. A keylogger may also require access to the target computer to retrieve the log files, but some programs will automatically email their log files at specified intervals. If you're thinking about installing a keylogger for the purpose of spying on someone else's activities, I would strongly advise against it. The chances of doing so without getting caught seem vanishingly small to me. And the potential downsides - breach of trust, broken relationships, even jail - far outweigh the benefits. If you're worried that someone may have installed a keylogger on your computer, you should run a full scan for malware. Even that may not find all keyloggers, so you should inspect the list of running processes displayed by Windows Task Manager for unknown processes. 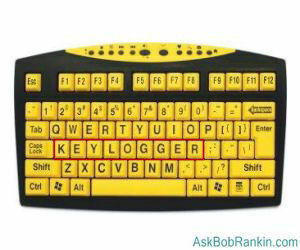 As a last resort, try installing I Hate Keyloggers. This antikeylogger utility defeats the software "hook" through which keyloggers eavesdrop on what you type. The keylogger's log file will remain empty. However, some legitimate programs use the same hook as keyloggers, so you won't be able to use them while "I Hate Keyloggers" is running. Most recent comments on "Should I Install a Keylogger?" I read your article on Keyloggers and as I was interested to see what the program did, I clicked on "I Hate Keyloggers". However, my Norton firewall denied access as a Malicious Website. Do you have any comment ? Can you tell me how many processes normally run in Win XP SP3? Which are the Windows's simple processes? How can I recognize suspicious processes in Windows Task Manager? EDITOR'S NOTE: That varies a lot, depending on your hardware and installed software. The best way to check for bad ones is to run something like MalwareBytes or X-RayPC. Yes. I also looked at that Ihatekeyloggers site. It looked shady to me . . . so I moved on away from it! I am very pleased with this App and it's F-R-E-E, of course!!! This may open a BIG can of worms, but if I want to monitor my 8th grade son's computer use while I am in the shower, or out jogging, or cooking, what would be a good program to use? Filtering for some reason disrupts transmission of the very large files I send for work. I trust him (mostly) but he is still a little young for unsupervised use. Reason: Malicious Web Sites. Sites in this category may pose a security threat to network resources or private information, and are blocked by your organization. EDITOR'S NOTE: It's a false positive. I clicked on the link to I Hate Keyloggers, and my dns provider (ClearCloud) immediately blocked access. Hardware keyloggers (in the USB port)are also available. On a stationary pc where the pc is hidden away they are not easily seen and as far A's I know they cant be detected by software and works even for the main Windows/Linux signon password. They have a secret passphrase that you enter to read the contents in the memory. This is further to my comment above. I reported I Hate Keyloggers to ClearCloud, thinking that at the least they'd check it out and let me know for sure. I just got an email from them stating that they'll be removing that site from the blocked list in the next update.